Recently we’ve been looking into sustainable building materials, like skyscrapers made of wood. We’ve also been examining the slowly crumbling infrastructure, largely made of concrete. Perhaps it’s time to combine the two ideas—and look at recycling concrete. A team of scientists at Notre Dame are trying to figure out whether something can be done with old concrete structures besides tearing them down and dumping them somewhere. This is a problem that will only become more pressing. 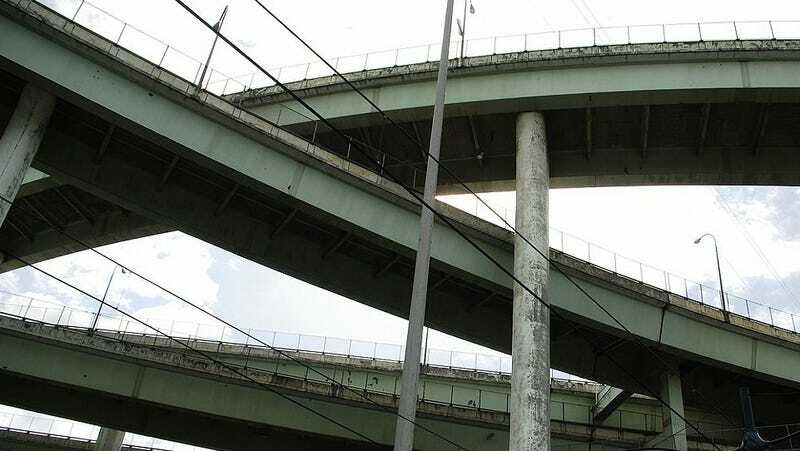 Concrete freeways and bridges see a lot of wear and tear. It’s only a matter of time before they have to be replaced—at which point we’ll need more concrete. It seems like a waste to toss concrete away, only to send out vehicles to quarry, crush, and deliver yet more concrete. We already do recycle some concrete. Due to safety concerns, concrete that was once a bridge or a building has to be turned into something which doesn’t bear as much weight, like a sidewalk. The team at Notre Dame, in partnership with University of Texas and New Mexico State University, are looking at different sample of concrete and assessing the quality of the material, and whether use and the elements will deform it over time. If used concrete can stand up to both humans and the environment, we may see a day when we can re-use concrete over and over—and it becomes a sustainable material. Cities can be literally broken down and reformed again and again.